This story somehow seemed appropriate for Halloween. But it is for real (this is Halloween, not April 1!). The role of amateur scientists in this matter is especially interesting, as is the radio-astronomy follow-up. Stay tuned! Si5351 -- G4GXO says "Give it a go!" Many of you will know of the low cost Si5351A programmable clock generator which can serve as a VFO with a remarkable range of 2.5kHz to 200MHz. This device is available from the larger industrial component suppliers such as RS for as little as £0.68 +VAT and is offered as a small PCB module with regulator and level converters from many amateur component suppliers for around £7.00. I bought a couple of the Adafruit modules to evaluate as the second conversion oscillator in a DSP IF system I’m developing and once I’d overcome the hurdle of writing the dsPIC33 software to drive the device I decided to test the unit as an HF VFO. My reason for doing this was to assess the phase noise of the si5351A; a quick Google will turn up many blogs and forum listings on this subject with mixed opinions of the suitability of this device for VFO service. With no direct method of measuring phase noise I decided to examine instead the impact of phase noise on receiver performance, after all it is this effect that will determine the suitability of the Si5351A as a VFO. My strategy was simple, I used the receiver section of my 60m SSB transceiver which is based upon the Eden IF (SPRAT 144) and uses one of the club 9MHz SSB filters. The front end mixer is a discrete diode ring made from two trifilar wound FT37-43 toroids and four 1N4148 silicon diodes. Unlike a schottky diode mixer this silicon switching diode version requires more drive to keep conversion loss down. 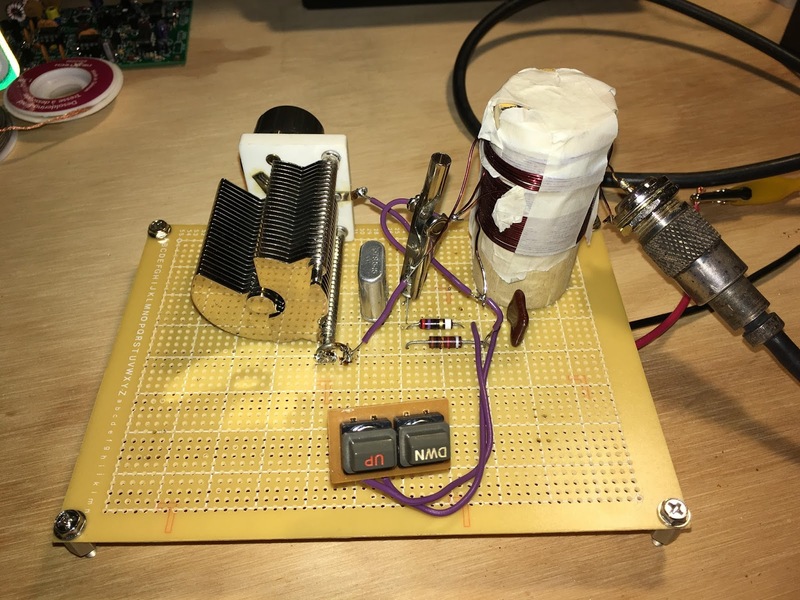 The VFO is a low phase noise 7ppm Si570 running on the high side of the IF at 14MHz, a MMIC output stage delivers +10dBm of drive to the mixer. The Si5351A was compared directly to the Si570 – which is a known “very good” performer. The test strategy was to measure the receiver Minimum Discernable Signal (MDS) at 5MHz with the Si570 and the Si5351A as the VFO. With no buffer stage to raise the 5dBm output of the Si5351A to match the +10dBm output of the Si570 VFO module, I accepted that this compromise would have some bearing on the results through increased mixer loss. Some if not most of the 4dB difference in MDS is without doubt attributable to the lower drive power of the Si5351A in my test configuration, this is borne out by the AGC threshold which moved up by 4dB suggesting increased mixer loss. I’m confident that had I been able to match the +10dBm output of the Si570 then it would have been a close match. My conclusion is that for HF at least the Si5351A is a very useful oscillator which is easily applied and can deliver good performance. If you had doubts about using this device at HF I hope that these results encourage you to give it a go! First off thanks for the wonderful podcast. I only just discovered it and I have loaded as far back as I can go on my Phone. I have been listening to it every waking moment. Though I fear that even at one or 2 a month no amount of commuting, dishwashing or bathroom cleaning will allow me to catch up with you. I so identify with your idea of the Knack. I was forever taking things apart, my mom had to remove anything that could be used as a tool from her home for my first few years as even at age 2 I was into clocks, cabinets and basically anything that wasn't nailed down. Until your podcast I hadn't even heard of the International Geophysical Year, but discovered I missed it by only 3 months being born in March of 59. I do think though that those of us that were even a little knackish were encouraged on our way by the Space program. Even though I grew up in Canada, I was riveted to the TV for every space launch, touch down or space walk. Many of my first memories are watching grainy broadcasts from Gemini and then on to Apollo. Even now I stayed up to watch the Mars rover land those few years ago. Radio was always a special interest for me from the First Short wave radio I got from my grand father. I remember discovering WWV, BBC VOA and the Netherlands english language programming. This of course launched me into a frenzy of stringing wires higher and higher much to the chagrin of my parents. My poor dad that was an arts major didn't know what to think of me. 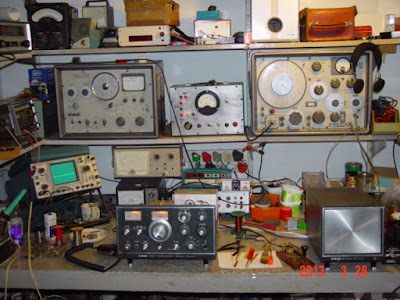 I'd always wanted to get in to ham radio but the code requirement held me back. My dyslexia kicked me really bad. I had the little tapes from radio shack and I'd work and work but got no where. So i resolved myself to just shortwave listening. I was laughing when you talked about your relationship with Regenerative Radios as one of the first radio projects I built was the "Science Fair Globe Parol Regenerative Radio" From radio shack. Here is a link to the thing http://www.ohio.edu/people/postr/bapix/rsglobep.htm I still have it at my mom's house. The last time I put batteries in it it would at least get WWV. Which is no small feet when you realize I built it with one of those Weller Soldering Guns that you could reseal canned goods with. I'm sure if I opened it up now there'd be blobs of solder the size of Cicada's in there. I was just listening to Episode 147 where you were talking about the All American 5 tube radio. I must have tore down 20 of those things as a kid. Your Right they were dangerous as anything you could get. Most of them the chassis was hot if the plug was in wrong and there wasn't like a fuse or any safety equipment in there to stop you from hurting yourself. Yes they were cheep and made so without a transformer, and all the tube heaters in series with the panel bulb for a bit of protection to prevent a surge on power up. But one other feature they had was that when they were originally produced there was still some DC mains power around and they would run if you put in the Plug the right way. My old electronics teacher claimed that you could run them off 3 45 volt batters on the Farm in a pinch. 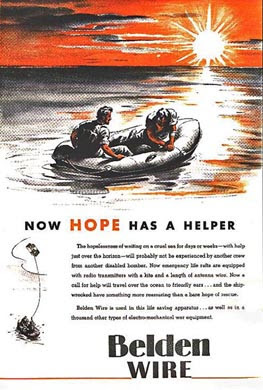 Though 19 40's battery technology I'm not sure if that was a practical solution. Though In High School that's what we had to learn. Learned to tune, debug and repair those puppies. After high School I went into the phone company and later made my way as a lot of us Knackish people in to the computer/software industry. And low and behold after about 30 years they dropped the Code requirement and now living in the States I went out and finally got a license. I just wish I had found your podcast sooner as I would have done things a little differently. However I have managed to do some serious kit building. I have built two TNC's, one for the beaglebone and one for the Pie. I have built one softrock receiver and another Softrock emsamble RXTX that I'm just trying to figure out how to make work. I also built though it's not really a kit a Kx3 that is my main HF rig. 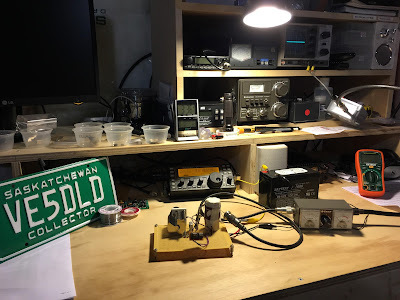 I thought I was really interested in the computer radio connection but wow when I see what you have done with the BITX and the manhattan build I'm thinking I want to build a rig that maybe I can run some JT65 or PSK31 on. I know what you mean about the Phone and SSB but right now stuck in the city of Chicago my antenna space is limited and i'm surrounded by power poles so I have a lot of noise no matter what I do. One thing I need to talk to your buddy Pete as in the left over spare time I have, between work family and radio I'm trying to complete the BSC that I never did during my misspent youth. But I'm stuck at the final project. I need something that needs some code and could be written up as a research paper I keep thinking there has to be a radio project here somewhere. Anyhow that's enough I'm sure you get lots of people with their stories but I thought a little of what I encountered might be interesting. I really appreciate the podcast love all the personal stories combined with the tech talk. Keep up the good work. I'm looking forward to getting current. P.P.S Again catching up on the podcasts though my podcast listening time is a little reduced as I bought your darn book that's very interesting! But I wanted to make sure that I did inform the Knackers Union, whom I believe that Steve Snort Solder Smith is the enforcement officer that I had already constructed my 40m low pass from 4 state QRP. 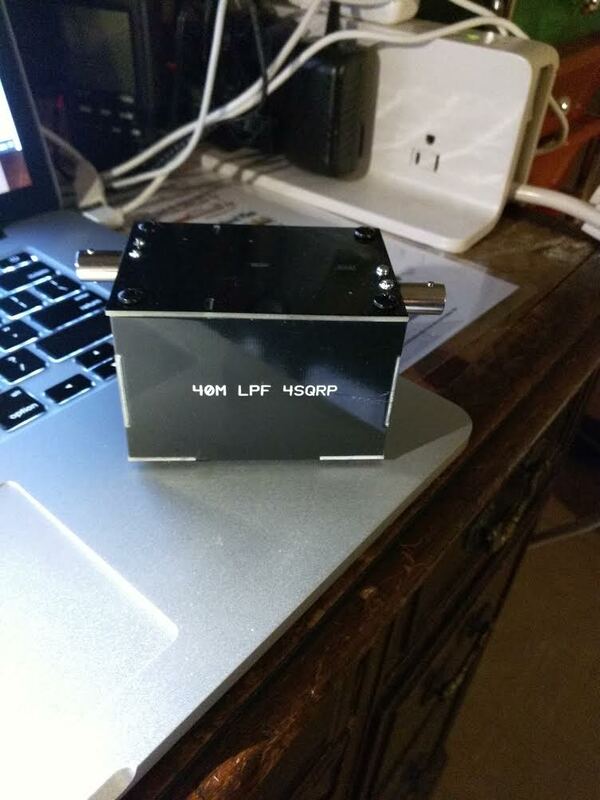 I have provided photographic evidence of it's construction and promise not to QRP on 40M without it. David Cowhig WA1LBP and I are the only two Foreign Service officers to have also been 73 Magazine "Hambassadors" (impressive, right?). David was covering Okinawa for 73 (and for Uncle Sam!) while I was doing the same in the Dominican Republic. It is not exactly about ham radio, but there is a lot of electronic wisdom in Mr. Collins' book. You folks will like it. I especially liked the hand-drawn schematics -- this adds soul to the book. Nicolas Collins is an interesting fellow. He is Profesor, Department of Sound, The School of the Art Institute of Chicago. Ed Walker, the long-time host of "The Big Broadcast" on WAMU-FM in Washington DC passed away on Sunday night, a few hours after his final broadcast. I was a regular listener. Born blind, Mr. Walker grew up with radio as his constant companion from an early age. By age 8, he was operating a low-power radio transmitter in his family’s basement, beaming music to his neighbors’ houses down the block. He would go on to spend almost all of his adult life involved in the medium in some way, all of it on stations in Washington. Wow, sounds like he had the Knack. I wonder if he ever had a ham radio license? Dean and I made contact. We both were in and out most of the time, but conditions seemed to improve towards the end where I could understand Dean about 90%. Using the RST "by the book", I would say he was a 33, 3 =(readable with some difficulty), and signal strength was 3=(weak), and based on what Dean was reporting, my signal back to him was the same - 33. This week Dean got a decent 40 meter dipole up in the air. We arranged (via e-mail) to meet on 40 on Friday evening. We made contact, but conditions weren't great. We tried again several times on Saturday, looking for open spots amidst the madness of the CQ WW DX contest. Rick N3FJZ joined us and also tried to make contact with Dean, but had no luck either. Daytime conditions didn't allow for a good contact between Indiana and the Washington/Baltimore area where Rick and I are located. Finally, last night after family obligations at both ends settled down, Dean and I found a relatively open frequency on 40 and made a good contact. A short snippet of it can be heard by clicking on the link below. Keep in mind that Dean was running about 2 watts to a dipole on 40 at night. Michael DF2OK has been melting solder in Germany. Above is a short video of the first sounds made by an AC-1 replica he built. Michael notes: "Yeah, I love these old style radios. You can see nearly everything. :-) BTW: All without Arduino and other black boxes and chips!" Finally, here is a nice video of Michael's 40 meter regen receiver. Anyone who has built or worked with a regen will understand perfectly this video. Watch Michael tune in stations while adjusting the regeneration. Note his demonstration of the lack of hand capacitance. FB Michael! Thanks! Thanks for letting us know about this Wayne. We have long been big fans of Elecraft and are proud that a picture of your KX3 appears on all of our blog pages under the headline "One of the Best Receivers in the World." Pete and I will continue our study and discussion of phase noise; as synthesizers make their way into more and more of our hombrew rigs it is important for us to understand the significance of this parameter. November 2015 QST -- Wrist Radios, Phase Noise, and a 1958 BITX! Page 30. 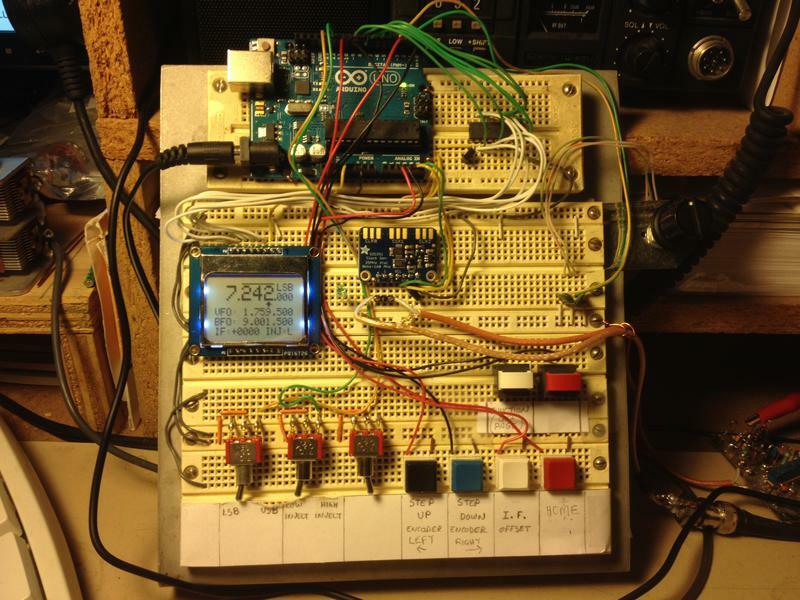 Glen Popiel's article on the Arduino. Page 33. I know this may come as a surprise, but in spite of my admitted Ludite tendencies, I found the article on High-Speed Wireless Networking to be very intriguing. Page 38. Hey! 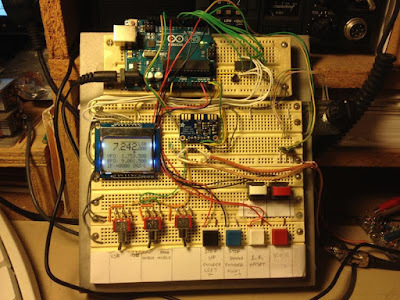 Mike Aiello N2HTT has an article about an Arduino-based CW recorder. FB Mike! Page 54. Review of LNR LD-5 QRP Transceiver. "The LD-5 is actually an SDR in a box with switches and knobs..." They give a phase noise graph. Page 58. Review of Synthesizer upgrade for the Elecraft K3. Uh-oh. Phase noise again. The review says the upgrade results in a reduction of phase noise, but the graphs seem to show an increase in transmitted phase noise on 20 meters as soon as you go 10 kHz from the transmit frequency. I guess this is a tradeoff for a larger decrease in close-in (less than 1 kHz spacing) phase noise? But if the objective on the transmit side is to deal with "a major problem with multiple operators in the same band segment in close proximity" resulting from transmitted phase noise, is this a good trade-off? Also, it would have been interesting to know if the reviewer could detect -- by ear -- any improvement in the received signal. Page 82. 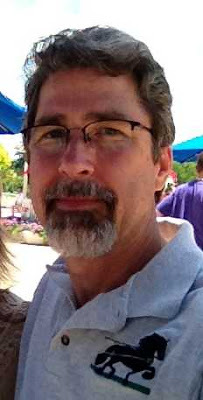 Ross Hull. Very interesting article, especially the part about OM Ross's untimely death by electrocution. Page 100. "The Cosmophones" by Joe Veras. Cool pictures (as always) from Joe. 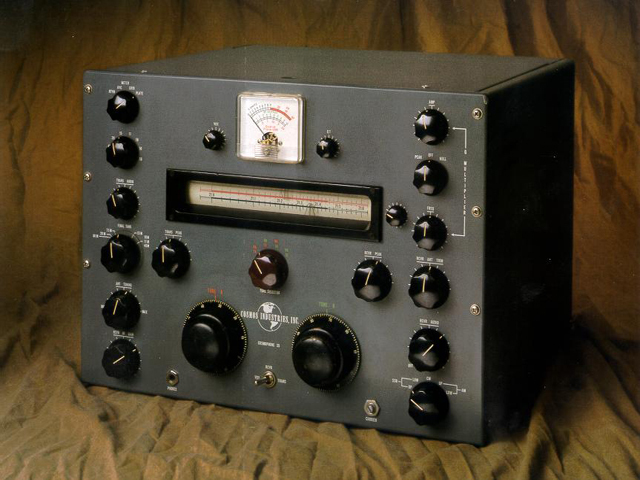 And I loved the first lines: "What in the world is a bilateral transceiver? Byron Goodman, W1DX, posed that question in his June 1958 QST review of the Cosmophone 35." Wow, four months before my birth By Goodman was writing about BITXs in QST! Hackaday has an article today that is, for me, very timely. In our last podcast, Pete and I were discussing the meaning of the word "homebrew" in the world of Software Defined Radio. As always, Pete was closer to the cutting edge, while I remain mired in Ludite (one D please!) curmudgeonism, committed to RADICAL FUNDAMENTALIST HOMEBREWING. No chips and no menus for me please. Today, the Hackaday guys came to my rescue with a blast from the past. Homebrew computers! Not that simple "buy a mo-bo and plug in some boards" stuff. No, REAL homebrew, so HB that they even made their own components. 1968. I can dig it! I should have gone down this road. I had the C.L. Stong book "The Amateur Scientist" IN MY HANDS. It had some great articles about relay-based computers. I could have been rich! HB2HB! N3FJZ-N2CQR Si5351 and BITX TIAs on Both Sides, with Some LBS and Peter Parker Circuitry Too! I want to share my excitement with you. 16, 2015, and on a homebrew rig no less! 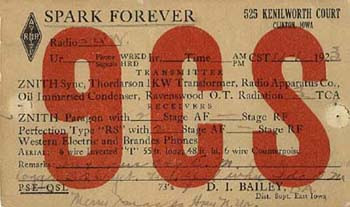 Oh the Joy of Emission!It was on 7.242MHz, 8:00 a.m. eastern on the "Woodpecker net". 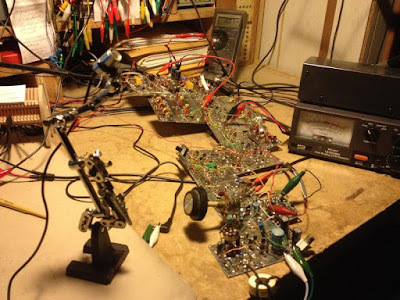 - Rig was based on the Bitx, using ZIA bidirectional amps. - 20 Watts into a 80 meter full-wave loop up at 20 feet. - 600 ohm homebrew open wire ladder line. 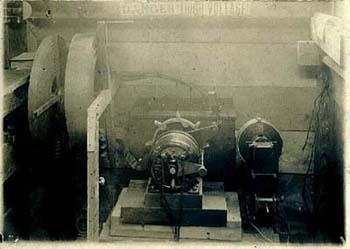 generator board. Thank you Pete. 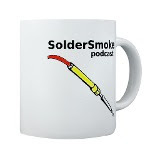 also put links to the SolderSmoke blog and to Pete's web page and blog. would give me the drive venture on. Thank you! HB2HB contact if you want to try. net any Friday, Saturday or Sunday on 40 meters 7.242MHz 8:00 a.m.
contact with you would mean the world to me. watts on my end, it may be a stretch, but we could try. Thank you both again for the joy you have given me with your pod-casts. 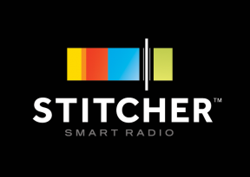 Be sure to listen closely at around 21 minutes when Rick describes a software feature that allows him to switch -- with the touch of a button -- from high side VFO to low side VFO. The BFO frequency also changes to account for the resulting sideband inversion. Very cool. Check out the N3FJZ QRZ.com page for more info. -- Our audience IGNORES Pete's guitar intro! -- Pete on QSO Today Podcast. -- Part 97, The Radio Art and International Goodwill. -- Pete connects his new beam to the KX3. -- Pete puts the Bell-thorn on 20. -- Bill fights noise in the DIGI-TIA. -- Bill fights power-line noise (and wins!). -- Drake 2B, skirts, reduction drives, and tuning rates. -- Warming up (with!) 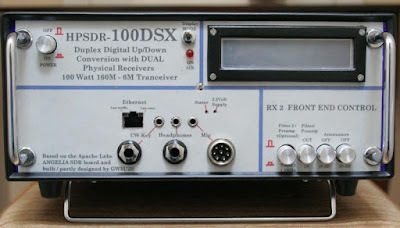 the DX-100. -- N2CQR -- N6QW First Ever HB2HB QSO. -- Listening to Chinese CubeSats. -- SDR Dongle as a bandwidth checker. 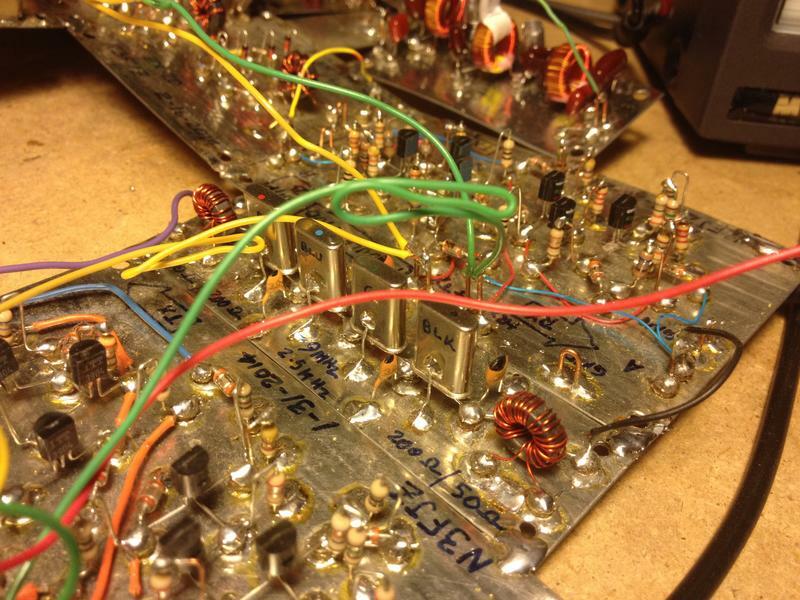 -- SDR and the Future of Homebrew Radio. -- Dean's First Ever QSO with his HB rig. -- The Martian -- Did Mark Watney REALLY have the Knack? Nice work Dean! 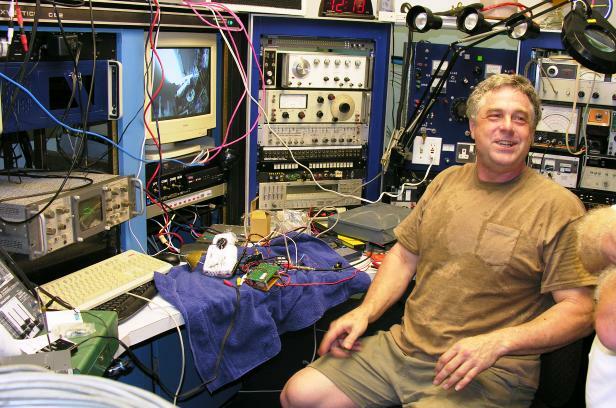 With this rig, Dean recently had his first ever ham QSO. FB OM. I am Pieter callsign ZS3AOR. I came upon your E-Book at Amazon and downloaded it to my Kindle and man, I really enjoyed reading about your endeavors with everything. The way you explained for instance the inner workings of transistors and mixers and problems associated with it is really good. Subsequently I downloaded the August Podcast and I am hooked with you and Pete. As I've been saying on the podcast, contacts in which both operators are using homebrew gear are increasingly rare, especially on SSB, and especially, it seems, in the USA. So let's chronicle these rare events. I've started a Label here on the blog called HB2HB. Send me reports of good HB2HB contacts -- recent or past -- and I'll try to get them onto the blog. I've already described my recent QSO with Pete, N6QW. My second HB2HB from this location took place on 12 October 2015. 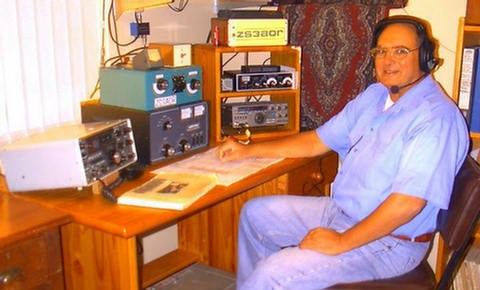 I talked to Jeff GW3UZS in Cardiff, Wales on 17 meters. I was using my trusty BITX17. Jeff was running a much more sophisticated homebrew rig -- see above. More details on Jeff's beautiful rigs are on his QRZ.com page"
So send in HB2HB reports. These contacts are almost in "endangered species" category -- they deserve to be preserved! Michael Rainey's underground shack in Vermont is undeniably cool, but these folks have REALLY gone deep. They are almost a mile down, blocking out that nasty cosmic ray QRN, building sensitive detectors to QSO with some extremely elusive DX: DARK MATTER. SEE IF YOU CAN SPOT THE TEK 'SCOPE. Wonderful video. Thanks to Ira Flatow and Science Friday. The wizard of Melbourne Beach, Peter Parker VK3YE, has written a book about QRP. Check it out here. Peter's book is available as an e-book from Amazon. 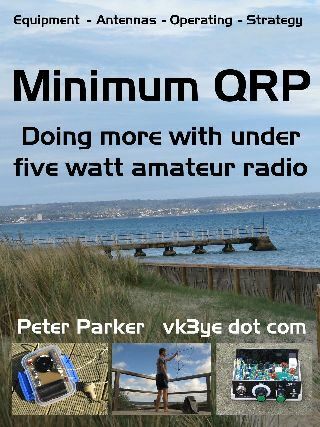 Details on how you can get it are here"
Thanks Peter for this important addition to the QRP literature. I was telling Pete that thousands of years from now, archeologists will be puzzled when they find, in many remote corners of the world, strange homebrew electronic devices with the symbol "N6QW" emblazoned on them. Who, they will ask, was the cult leader N6QW, and how did he get his followers to build these devices? Thanks to the work of Mikele 9A3XZ, Croatia will surely be a major center for research into the N6QW cult. Check out Mikele's video. Stick around for the full 6 minutes and you will see the many N6QW rigs that Mikele has built. FB Mikele! Keep up the good work! Tonight I have had my first experience with the joy of oscillation! I'm so happy to have my M3 oscillating! This was a great first project and look forward to seeing if I can't build a lowpass filter to go with it. As you recommended Bill, I reconfigured my initial board to make things much more compact thus keeping the lead length short. For the coil, i used a 1.25in wooden dowel and it worked great! Here are a few photos. Thanks a lot for the crystal! Video will be coming soon. 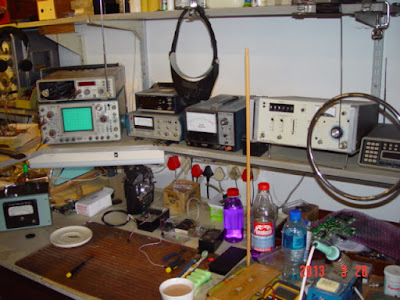 Looking forward to Pete's 40m transceiver project. Keep up the great podcast! I just had my first QSO with my ZIA transceiver! Contact was with W8ERN in Brighton Michigan, which is approximately 300 miles from my QTH in Nashville Indiana. W8ERN said I was barely audible and was surprised that he could hear me at all. Especially when he found out that I was running less than 5W on an end-fed wire. From what I heard, band conditions were pretty poor due to a magnetic storm. Sorry I didn't get any video of the QSO. I heard him calling CQ and just answered. I didn't expect him to return my call. Btw, this was my first QSO as an amateur. I was a bit nervous, I don't know why. I plan on installing a 40M dipole before winter sets in so, hopefully my signal will get out a little further. I have one other question. I am considering purchasing a used rig in the next few months. What would either one of you recommend? I am not abandoning my home-brewing but it would be nice to have a back up rig when conditions are bad. My budget is around $200 or so, and I don't mind something that might need some repairs. There is a hamfest in Fort Wayne(my hometown) next month, so I might go up there and do some shopping. Thanks again for all of your encouragement and knowledge. Congratulations on your first contact on the TIA AND your 1st contact as a ham. Bravo. Time to have a real celebration. 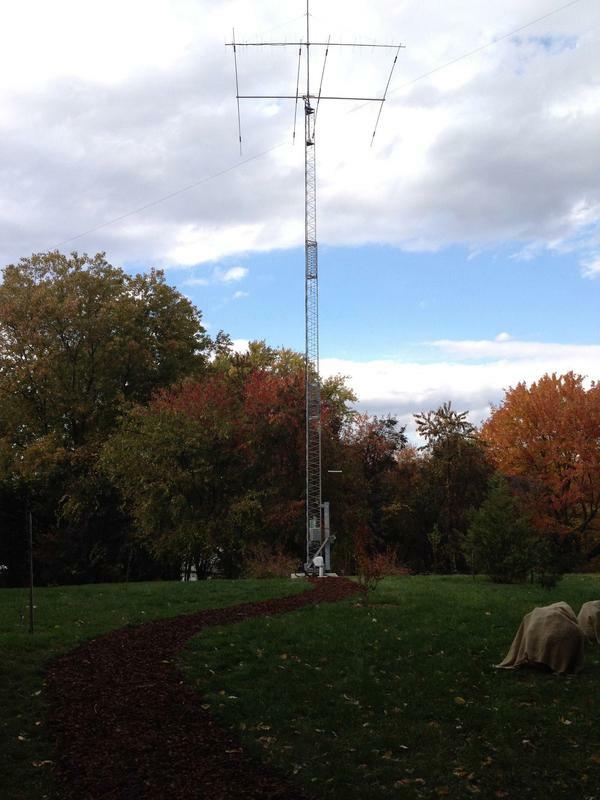 Get cracking on that antenna before you have snow on the ground!!! W8ERN, Angelo is an outstanding amateur and and a real gentleman. He has a very interesting past life. I think he worked for Multi Elmac and Central Electronics. During the 1940’s to 1960’s these companies produced some of the best ham gear. The AF-67 Transciter and the PMR8 were used mobile and of course the CE 100V and 200V were the first No Tune vacuum tube transmitters. So you were talking to one of the radio gods. Again Congratulations Dean --- Bravo. Wow that's great. Indeed the band conditions are about as bad as they get. So bad that they are seeing Northern Lights (Aurora) far south into the USA. Give it a few days and you will find much better conditions. My advice on a commercial rig: DON'T! You may think that they'd do better when conditions are poor, but they really won't. If you want a bit more power, build an amp for the TIA. You are off to such an amazing start as a true homebrew ham. Stay on the homebrew path. Build a completely homebrew station! Congrats! Thanks very much for the mention in your tenth anniversary podcast! It is great to know I am embedded in internet history even though I am not that important. Grand Pooh-Bah is, as you say, a Flintstones character, but it is not the the origin of the term. It actually goes back bit more than a century. The original character was named Pooh-Bah and was Lord High of nearly everything. He appeared in The Mikado by Gilbert and Sullivan in 1885. There really are a fair number of non-software experiments that can be done with SDR. My first SDR was a set of boards assembled by Gerald when he was first starting Flexradio in 2002. 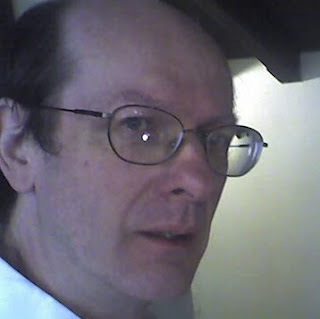 His plans were very much homebrew and were published in QEX July/Aug 2002. My second SDR was a homebrew kit put together by Tony Parks, KB9YIG in 2005. He still sells SDR kits as fivedash.com. All this is very much home brew and does not rely on obscure hardware blobs. Have a look at the schematic for the current softrock at Ensemble II Schematic.pdf. It only uses "jellybean ICs". According to the Smithsonian magazine, "Despite their modern reputation, the original Luddites were neither opposed to technology nor inept at using it...A seemingly endless war against Napoleon’s France had brought 'the hard pinch of poverty,' wrote Yorkshire historian Frank Peel, to homes 'where it had hitherto been a stranger.' Food was scarce and rapidly becoming more costly. Then, on March 11, 1811, in Nottingham, a textile manufacturing center, British troops broke up a crowd of protesters demanding more work and better wages." It was only later that they became associated with resenting the machinery. I am also enjoying your discussion of the changes to our technology and how it affects hams and other technical people. I came into electronics as a young boy and at that time transistors were just beginning to displace tubes as a dominant force. I definitely remember the older techs saying, "These new transistor things are just sand-in-a-can; how can anyone know how a circuit operates with them." About 12 years later when I was in college I heard exactly the same comment as "jellybean" Integrated Circuits (7400 and 4000) began to displace discrete transistors. There was much musing about how the future would be one of just plugging ICs together and no design talent would be needed or developed. Fast forward another 20 years and the microprocessor moved from Primary CPU, to cheap CPU, to PICs and Atmels. Here came the same comment lamenting the loss of ICs that "we could understand" and "no more electronics is needed, just hook the blocks and write the software." Now about 10 years from then we are seeing complete transmitter and receiver modules, zigbee, wifi, and many other Adafruit style drop-in modules. I figure it is about time to hear that old saying once again. You and Pete need to be careful as you dance about it, don't fall into the trap ! So in the immortal words of Blaise Pascal in 1657, "I have only made this letter longer because I have not had the time to make it shorter." Keep up the good work and great podcast! In our last podcast I mentioned that I had a very interesting contact on 17 meters with Raul Midon AE3RM. This morning Raul's song "Tembererana" popped up on my Pandora feed. The song is great, but is was the album cover that attracted my attention. Raul has an amazing personal history. Born in Argentina, he and his twin brother have been blind since birth. They have both obviously triumphed -- his brother is a NASA engineer. Midón's album State of Mind was released on May 10, 2005. The album features a guest performance with Stevie Wonder, one of his idols, another one with Jason Mraz, and a song written in tribute to Donny Hathaway entitled "Sittin' In The Middle." 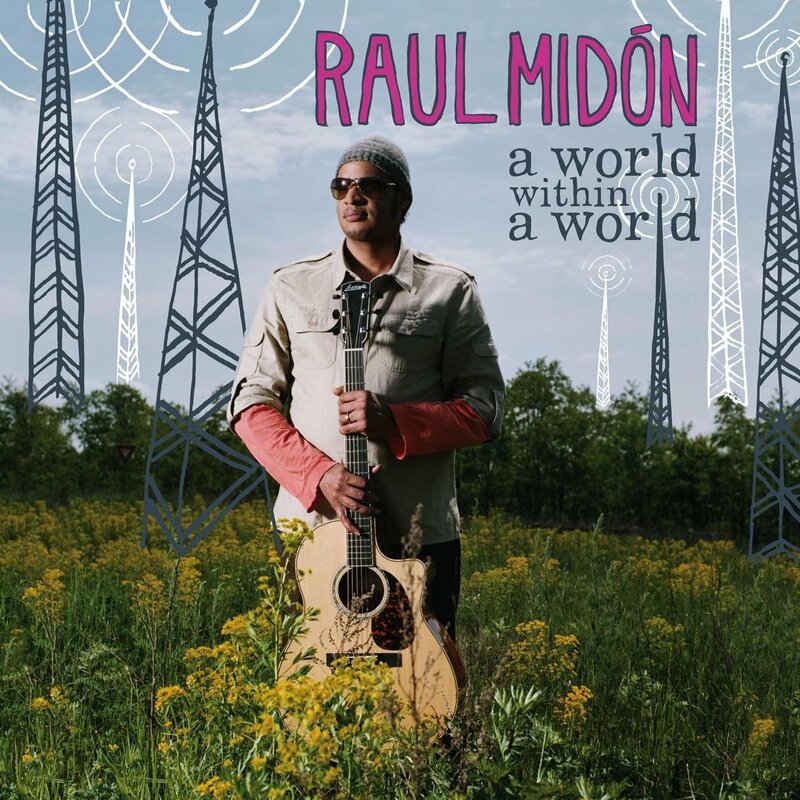 Midón is an avid amateur radio enthusiast, and in this song he also incorporates his call sign (KB5ZOT) by using Morse code. 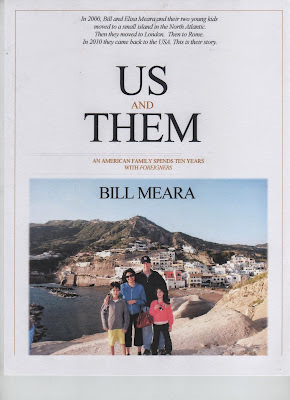 In it he writes: "He has been an amateur radio enthusiast since Mrs. Redmond introduced he and his brother to the hobby back when they both attended the New Mexico School for the Visually Handicapped." Good work Mrs. Redmond! Here is Raul's antenna in Maryland. Maybe he was thinking of this when he designed the album cover! On a recent podcast I mentioned that I like the phrase "the radio art." I also mentioned that I heard some objections to this term. A couple of guys wrote in on this --see below. I really like the last line of the first section of Part 97: e) Continuation and extension of the amateur's unique ability to enhance international goodwill. Yea! That's us! The International Brotherhood of Electronic Wizards! art. noun \ˈärt\ : something that is created with imagination and skill and that is beautiful or that expresses important ideas or feelings. Often the patent office, much older than radio, will invalidate a patent application based on “prior art”. Keep up the great podcast! As soon as I finish a couple of other projects, I’m going to try to build Pete’s LBS design. First, I have got to get a mobile rig installed in my new truck, commuting without it is just too boring. I was listening to episode #180 on the on the way into my office this morning and wanted to send you a quick note on the phrase "radio arts." Another example of why "art" is indeed the proper term is that the United States Patent Office (USPTO) classifies patents into, you guessed it "Art Units": http://www.uspto.gov/patents-application-process/patent-search/understanding-patent-classifications/patent-classification . and many many more as you can well imagine. Keep up the good work in furthering the radio arts! AK2B's Beautiful Si5351 Receiver -- Just Listen and Watch! Tom Hall does amazing things with solder and electrons in the heart of New York City. I give him extra credit for doing this on the island of Manhattan because 1) that's where I'm from and 2) EVERYTHING is more difficult there. I may have presented this video before. If I didn't, I should have. And if I did, well, here it is again (I guess my NYC attitude is showing here). Look at the ease with which Tom switches bands. Fantastic! But even more important, LISTEN to the quality of the reception. Listen as Tom tunes in on strong CW and SSB signals. Do you hear any signs of the dreaded phase noise that is supposed to plague the Si5351 chip? I do not. I think this receiver sounds great. SatNOGS: 3D Printed Az-El Rotators! Ray-Gun PVC Helical Antennas! Arduinos! Dongle Receivers! As a result of Elisa's suggestion, more than 1300 people downloaded the free Kindle version of "SolderSmoke - Global Adventures in Wireless Electronics." I hope they liked it. If you did enjoy the book, please spread the word about it (you can use the e-mail button below to forward this post to friends and relatives), and please put a review on the Amazon Kindle page. In the course of following up on Elisa's idea, I discovered that Amazon Kindle has a program that will allow me to make my more recent book available for free (for a limited period). So the Kindle version of "Us and Them -- An American Family spends Ten Years WITH FOREIGNERS" will be available for free from October 3 through October 7. Please send me feedback, please let your friends and relatives know about the book (again the e-mail button below is good for that), and please post reviews on the Amazon page. For the last couple of weeks I have been plagued by noise on the HF bands. In spite of being in a very built-up area of Northern Virginia, I usually have low noise levels. But for the last couple of weeks I've had intermittent but frequent arcing noise. It sounded like classic power line arcing. My 17 meter Moxon antenna provided a clue as to where it was coming from: As I spun the antenna around, the noise was always a lot stronger to the North-North West. On Wednesday morning on the way to work I noticed that the fire department and the power utility were working frantically on a pole about a mile from our house. It had obviously been on fire -- it was still smoking when we went past. When I got home I was pleasantly surprised to find the arcing noise gone. It took me a few minutes to make the connection -- yes, the smoking power pole was to my North-North West. OBVIOUSLY THE RADIO GODS CAME TO MY ASSISTANCE! This was a good demonstration of the fine front-to-back characteristic of the Moxon antenna. And a reminder of what radio signals sounded like in the days of spark. First let me congratulate you. That is one fine build and you may actually have absolutely nothing wrong!!!!!! I really must applaud your “squares”. They look like they were made on a CNC machine. Bravo!!! You are operating the LBS without an RF amplifier and as such you are trying to make up the gain in the audio amp. I would say that the results you are hearing are very consistent with the DCR without an RF amp. Get the RF amps stage working and then run your test –you will find with the RF amp that at the gain setting you have for the video will be room filling. It actually sounds pretty good. You might also try connecting a 1 NF across the audio trimmer pot as that will cut down on the “hiss’ sound. Concentrate on the RF amp stage and then re-run your test –you will see the difference. Great build – very nice job. Sounds pretty good to me in terms of noise – that’s what a direct conversion receiver sounds like (they tend to be very wide in terms of reception – static is normal... Welcome the world without noise reduction and DSP!!). DCR’s – because they are not run through a narrow IF filter – allow a very broad range of signals to get to the audio stage. So, for example, if you tune that around during a CW contest, you’ll hear a LOT of signals at the same time – versus only one or two at a time, once you have this run through the 4.9152 crystal filter. That’s the nature of the beast. The 1nf across the audio trimmer definitely will help with reducing the hiss, although I must say my Kenwood receivers all have a similar amount of hiss and I prefer my radios with more, not less, noise (it lets me know what the band conditions are like...). 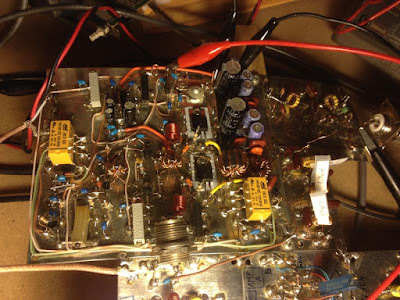 I have noticed on my builds, however, that if you have a very, very high pitch WHINE on the other hand, that tends to be a bad solder joint or bad capacitor somewhere – probably on a capacitor – introducing an offset into your RF someplace it shouldn’t. What that looks like on an oscilloscope is the audio signal will have a large DC offset versus ground – almost always a bad solder joint on a capacitor—or a bad/broken capacitor--somewhere in the audio amplifier. That’s the same problem you get when you try to record audio sometimes from an external source (TV, radio, CD player) on your computer – DC voltage offset on the audio line. Kind of like what you might have heard on a stereo if you ever tried to switch to a channel where the input was hanging open.